Engineering Excellence For The Sporty Engine. BROOKFIELD, Conn. – January 30, 2013. Spectro Oils of America, based in Brookfield, CT, is pleased to present Platinum Heavy Duty STL; Sportster Transmission Lube. Our 6 speed synthetic technology is now available for the Harley® Sportster and Buell®. This fully formulated synthetic transmission lubricant is engineered to work in all applications where the same oil lubricates the clutch, primary, and transmission. Spectro STL is a high-performance lubricant that provides superior performance and delivers the highest levels of protection for the Sportster drivetrain. Proudly made in the USA, with an API GL-1 rating, STL exceeds all known OEM and Harley-Davidson® warranty requirements. Spectro brands are manufactured and marketed by Intercontinental Lubricants Corp. of Brookfield, CT. ILC is one of the world’s foremost manufacturers and packagers of quality, specialty lubricants. Spectro® products are engineered to provide the highest levels of performance across the full range of full-synthetic, semi-synthetic and petroleum lubricants for all types of power-sports engines and transmissions. Spectro® provides unsurpassed strength and endurance to protect your engine against wear and tear.The Spectro® line also includes superior suspension fluids, fork oils, brake fluids, coolant, chain lubes, filter cleaners/oils, and appearance products. 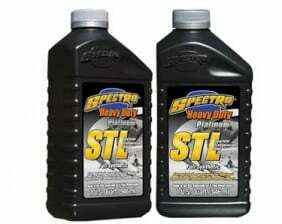 Spectro Performance Oils – Engineered Excellence!